The BBC struck a deal Friday with a senior journalist who quit her post to protest the British media company's gender pay gap. 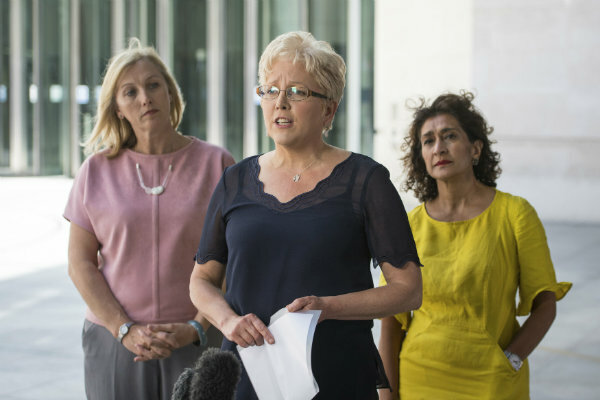 The broadcaster accepted that Carrie Gracie, the broadcaster's former China editor, had been told she would be paid along the same lines as the North American editor when she took the job. It also apologized for underpaying her. Gracie chose to donate backdated pay to The Fawcett Society, a gender equality charity, so that it could set up a fund for women who need legal advice on equal pay claims. "For me this has always been about the principle, and not about the money so I'm giving all of that money away to help women who need it more than I do," she said. "After all, today, at the BBC, I can say I am equal, and I would like women in workplaces up and down this country to be able to say the same." Gracie resigned the China job in early January after learning that male colleagues in similar jobs had much higher salaries. Her open letter of resignation fueled a national debate on gender pay. Gracie, who is still employed by the BBC, did not move to her next post quietly. She told Parliament's media committee that she was shocked to learn of the pay disparity. She testified that the BBC had treated women who protested the pay gap as "the enemy." "I thought I had won a commitment to pay parity when I set off to China, which is why I got such a shock when I discovered that two men as international editors were being paid at least 50 percent more than the two women international editors," she testified. She was earning 135,000 pounds a year. The BBC had already been embarrassed by the release last year of a list of top earners, which showed that two-thirds of the best-paid workers were men. Many men were also found to be receiving much larger salaries than women in comparable jobs. Six of its highest-paid male broadcasters agreed to take pay cuts in light of Gracie's actions. "I am pleased that we've been able to move past our differences and work through things together" the BBC's director-general Tony Hall said. "We can now look to the future." Gracie will now take unpaid leave at her own request and plans to use the time to speak on China and gender equality. She said it was a huge day for her, and for the BBC, which she described as her "work family." "Sometimes families feel the need to shout at each other," Gracie said. "But it's always a relief when you can stop shouting." A list of top earners at the BBC shows that men dominate the highest paid jobs despite pledges to grant women equal pay. PBS is collaborating with the BBC on a special live event this summer where cameras will try to catch bears, wolves, eagles and other wildlife in their natural habitat in Alaska.